Help us help you by answering the following German Shepherd questions. The winner will be notified on March 3, 2012. Thank you for taking the time to complete the questionnaire! Yes, I do ask for your name b/c I care about you. You are not a nobody and I am NOT a faceless corporation. Don't worry -- your information is totally secure. I promise not to share it. What's your biggest problem or frustration with your German Shepherd? 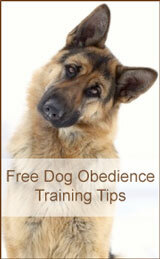 What do you want to learn about German Shepherds? What is the reason you became interested in them? What's your biggest frustration with owning a German Shepherd? What have you tried so far that hasn't worked for you? What's your biggest fear when it comes to your German Shepherd? What would you be willing to do to solve or get the outcome you want? What's the ideal outcome or result that you'd like to achieve? What would achieving that outcome or result do for you? If you could have one question answered about German Shepherds what would it be? * Shipping available for the continental US only (excludes AK and HI).